Video demo: Ivan Panitsky. "Oy, Da Ty, Kalinushka". Video demo: A.Borodin. Au couvent ( In a Monastery ). From the Petite Suite for Piano. Video demo: A.Borodin. Rêverie ( Dreams ). From the Petite Suite for Piano. Video demo: M.Mussorgsky. Hopak from the Opera "Sorochyntsi Fair". Video demo: Anton Rubinstein. Russkaya i Trepak. Op. 82 No 6. Video demo: German Galynin. Sonata in B minor (h-moll). Video demo: Ihor Shamo. Partying. 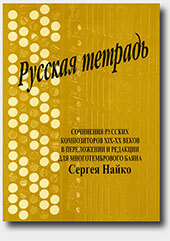 From the Piano Suite "Paintings of Russian Artists". Video demo: S.Slonimsky. Intermezzo in Memory of Brahms. by Sergey Naiko Russian Notebook.